Baracuta Manx TT G9 Harrington Jacket in black. Made in England. The classic Baracuta G9 harrington silhouette with retro racing stripe sleeves and stylish embroidered badge detailing. An awesome mod harrington jacket that benefits from the classic Baracuta Fraser Tartan lining, trademark 5 point umbrella back vent, double button collar and button down flap pockets. Padded with Thermore ultra soft insulation to provide exceptional warmth in colder climes. The Baracuta Manx TT G9 Harrington also features Coolmax technology - designed to keep the wearer cool and dry. The jacket is finished with retro ribbed hem and cuffs. The iconic Baracuta lion branding is overlaid on the stripes on the left sleeve. 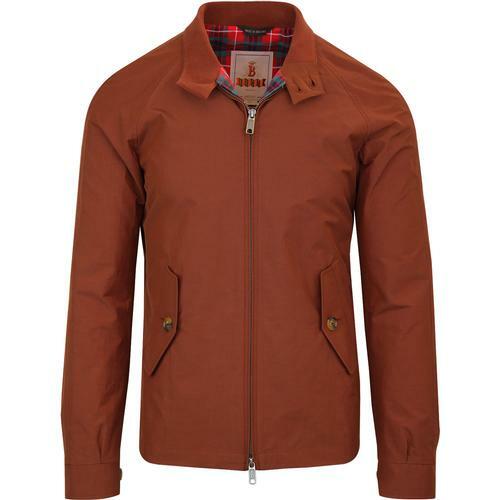 The jackets practical double zip detail is a typical trait of the Baracuta G9 Harrington. 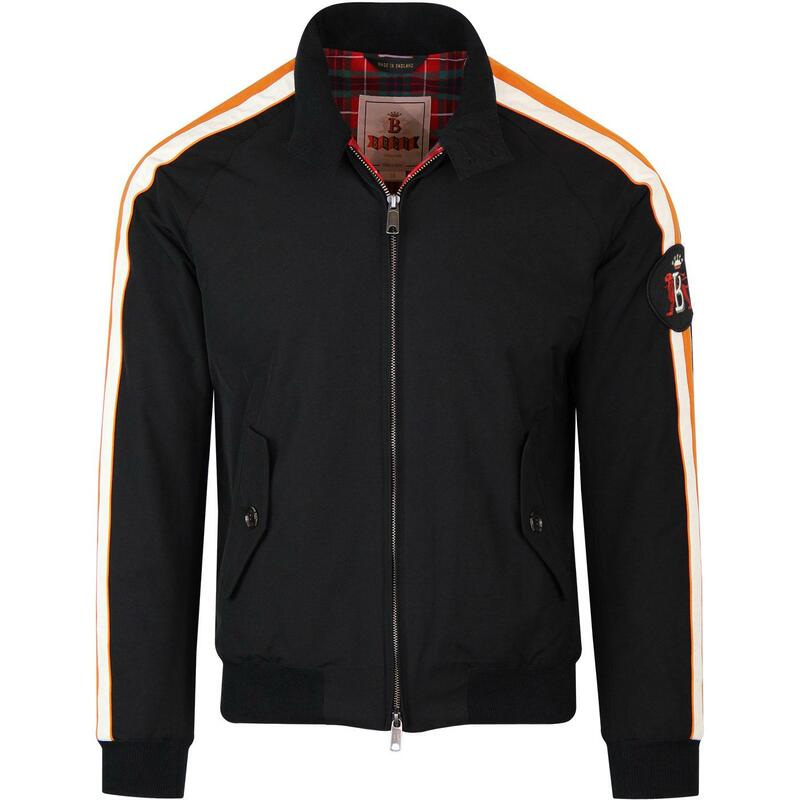 The striking orange and off white cut and sew retro racing stripes that adorn the sleeves add a cool and casual mod edge to this Baracuta Manx TT G9 Harrington. 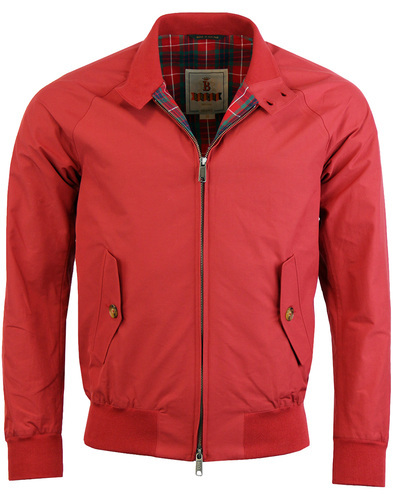 With a hint of Varsity and collegiate styling, the Baracuta Manx TT G9 Racing harrington will certainly catch the eye. Ideal for giving your ensemble that desirable retro sports and Casuals vibe. 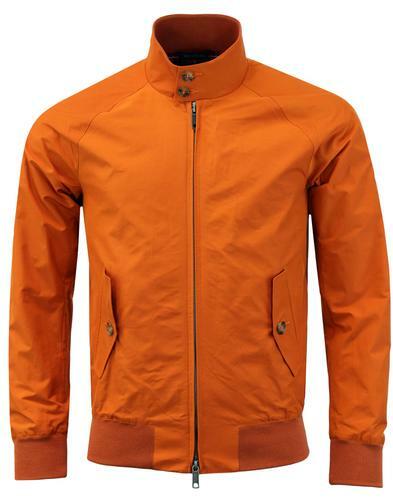 The Baracuta Manx TT G9 harrington takes it's name from the Manx Grand Prix motorcycle races held on the Isle of Man TT course. Baracuta Manx TT G9 Harrington Jacket in black. Orange and off white retro sleeve stripes. Baracuta lion badge to left sleeve. 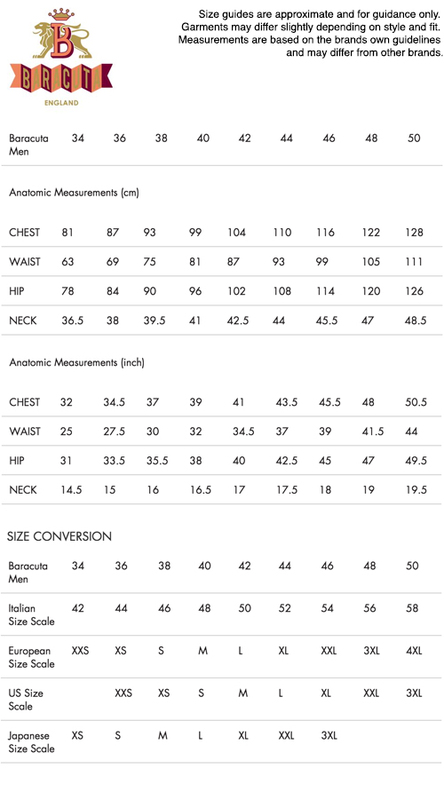 SKU: BRCPS0484 100 Baracuta Manx TT G9 Harrington. Composition: 50% cotton, 50% polyester. Lining 1: 80% cotton, 20% polyseter. lining 2: 100% polyester.